Angela and Mike from the Education Department here to talk about some new LilyPad products we're really excited about! 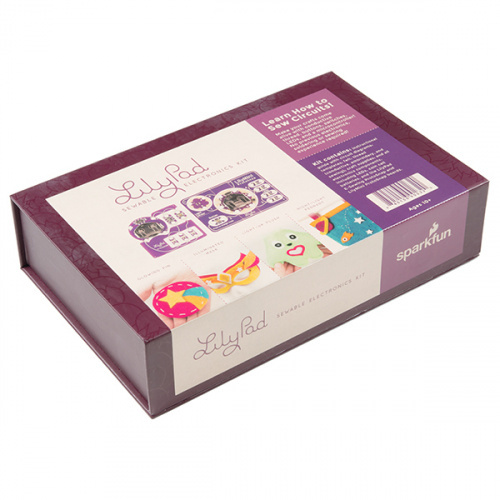 In the bustle of the holidays, you might have missed the release of our newest LilyPad product, the LilyPad Sewable Electronics Kit. We worked on this kit for most of 2016, incorporating feedback and requests from customers and educators, and we're excited to finally bring it to life! Craft Materials -- Felt, templates and sewing materials are all in the box, letting you get started on the projects right away without an extra trip to the craft store. Printed Guide -- A spiral-bound activity guide features full-color illustrations and circuit diagrams for each of the four projects in the kit. 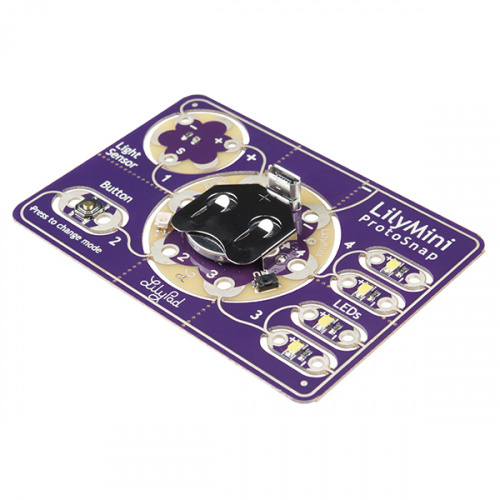 A Brand-New LilyPad Board -- Among the many other LilyPad components included in the kit is a brand-new LilyPad microcontroller: the LilyMini! We frequently hear from educators that cost is a major barrier to technology adoption in their classrooms. Teachers love using the LilyPad line to teach electronics and programming, but when you need to buy supplies for 30 students, many schools can't support the expense. To bypass this problem, many teachers are successfully using the smaller LilyTiny and LilyTwinkle boards in their classrooms. These boards are great for inexpensive blinky projects, but can be tricky to hook up to a computer for reprogramming. 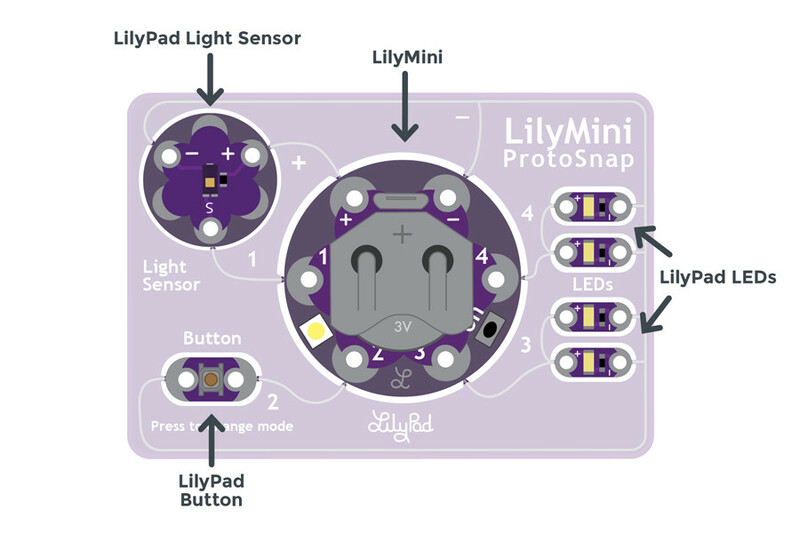 After talking with a number of educators, we realized what was missing was a new LilyPad board -- one that was good for simple projects like the LilyTwinkle and LilyTiny but easily reprogrammable like the larger LilyPads. Enter the LilyMini! Built-in Coin Cell Holder -- Many e-textile projects require that you sew a battery into your project before you can even turn it on, which is an additional burden for beginners. The LilyMini's built-in battery holder will make projects go much faster. 4 Sew Tabs -- Each one is capable of digital I/O, analog input, PWM output and other communications interfaces. Best of all, it's inexpensive; everything we wanted in a new LilyPad board! 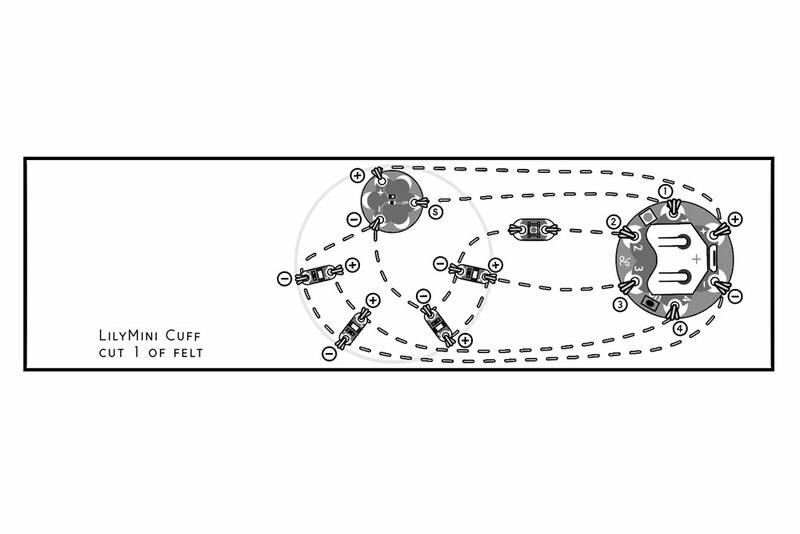 * Learn more about these advanced features in a tutorial coming soon. What is the LilyMini ProtoSnap? The ProtoSnap concept was originally developed at SparkFun by our QC director, Pete Lewis. There are currently six LilyPad products that use this format: ProtoSnap - LilyPad E-Sewing Kit, ProtoSnap - LilyTwinkle, Firefly Jar Kit, ProtoSnap - LilyPad Development Simple, ProtoSnap - LilyPad Development Board and the new LilyMini ProtoSnap. 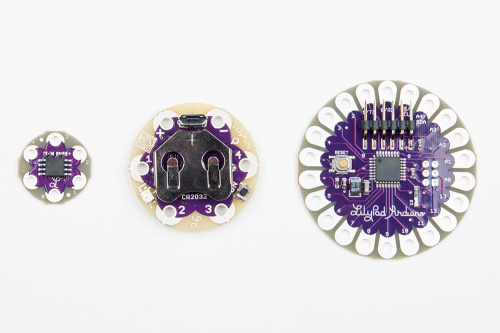 Each ProtoSnap product has a perforated circuit board containing a LilyPad microcontroller connected to LilyPad sensors or LEDs to form a working circuit. You can power up the board and explore how everything works, and even reprogram some of the ProtoSnap products before you snap the pieces apart. When you're ready, snap out the pieces and use them in your project. 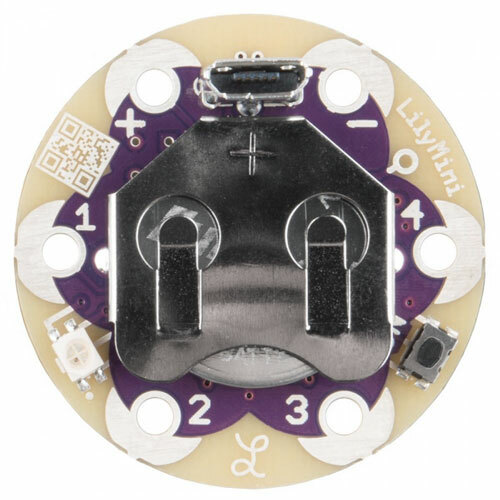 The LilyMini ProtoSnap includes a LilyMini connected to four LEDs, a light sensor and a pushbutton. We've preprogrammed the LilyMini ProtoSnap boards with example code that uses the connected light sensor to trigger different patterns on the LEDs. The code loops through three modes when the LilyPad button is pressed: a "test" mode that turns all the LEDs on (great for testing your sewn connections), a "breathing" mode that changes speed depending on the light level, and a "night light" mode that will twinkle the LEDs when the light falls below a certain level. 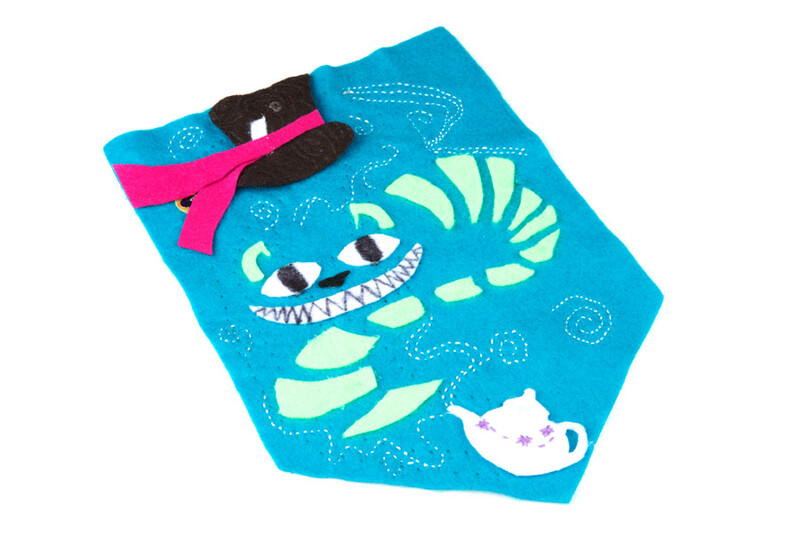 For more info, see the printed guide included with the LilyPad Sewable Electronics Kit or the online LilyMini ProtoSnap Hookup Guide. 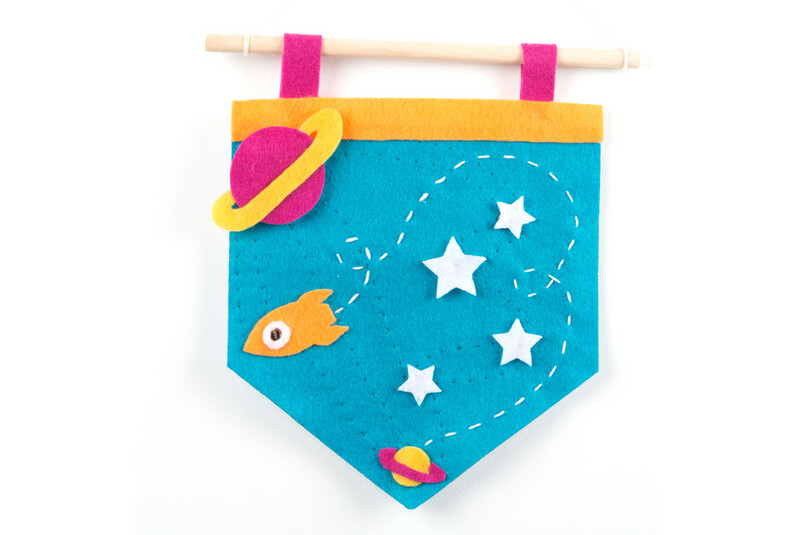 The Night-Light Pennant from the LilyPad Sewable Electronics Kit is a wall hanging that reacts to ambient light in the room. Working on a flat project is a great way to get started with planning an e-textile project. Check out the printed guide included with the kit or our online tutorial for instructions and a downloadable template for building the project. 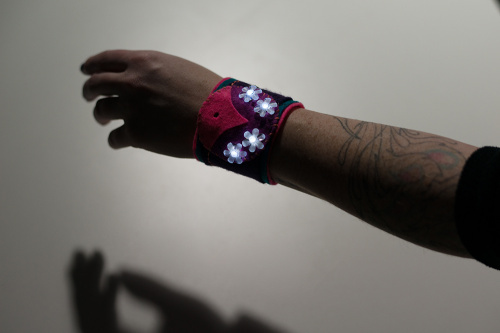 This felt cuff uses some plastic flower beads to diffuse and conceal the LilyPad LEDs for a decorative, light-reactive accessory. The light sensor is placed under a felt panel with a small hole cut to allow the sensor to gather light level readings. The LilyMini is hidden on the underside of the wrist, and the button is placed on the side for easy mode changes. These two projects utilize the pre-installed code on the LilyMini ProtoSnap. We're currently finishing up integrating LilyMini into the latest and greatest version of Arduino; look for a tutorial on adding LilyMini board support to Arduino in a few weeks. We have big plans for the LilyPad line in 2017, and plan on introducing more new products as well as updating some old favorites. If you have any ideas for new LilyPad boards or components, let us know in the comments. And get crafting; this is the perfect time of year for it! We're also in the process of adding these activities to InventorSpace for educators to use in their classrooms. Stay tuned! Luckily we've still got something new to the catalog. You can almost always "count" on a new product each Friday. Stop it, both of you, or I'll turn this car around.